We didn't do much sight-seeing in Houston, but we were able to spend time with a few of John's friends who were more than generous and welcoming. After a long and boring drive from New Orleans and Houston, we arrived at a little RV campground in Manvel, a suburb twenty minutes south of downtown Houston. We spoke with John's friend, Jimmy, who works for a craft beer distributor in town and managed to get us tickets to the Southern Star Brewery Anniversary Party in Conroe, TX. Unfortunately we didn't snap any pictures; we were too busy sampling Southern Star's tasty brews, eating burgers topped with pulled pork and chatting with Jimmy's hilarious friends and co-workers. Southern Star Brewery beers are pretty exclusively distributed within Texas but have started expanding to a few other southern states. If you get the chance, try their Bombshell Blonde Ale or their Buried Hatchet Stout. Very tasty. Our only suggestion for Houston was to visit Arthur Meyerson, a friend and contemporary of John's former boss, Jay Maisel. He invited us to come see his studio/office/home, housed in a nondescript former alarm company office. We were warmly welcomed by Arthur and his wife Linda, who after a glass of wine and friendly conversation, gave us a tour of the building. On the ground floor there's a gallery, the office area, a space for photo editing, and a lofty two-story storage area that houses Arthur's photography vault and a huge collection of cowboy boots. The second story is their home, the walls decorated with huge prints of famous photographs and souvenirs from years of traveling all over the world. Everything is colorful and eclectic with an interesting story behind it. After our second glass of wine, we walked just a couple of blocks down the street to Goode Company Seafood, the Meyerson's favorite restaurant (they couldn't stop raving about how good the food is). The Goode Company has, in fact, four different restaurants, all pretty much on the same corner. The barbecue joint is the original, then there's a southern comfort spot a block away, a taqueria across the street and the seafood place around the corner. We walked past all of them, they were all packed. How? The food is fantastic. Familiar but unique, and really well made. 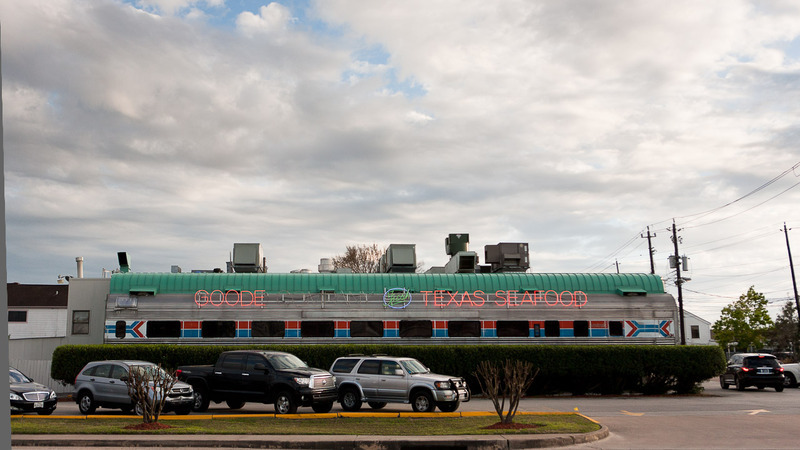 Goode Company Seafood is housed inside of an old railroad car and their specialty is mesquite grilled seafood and something called campechana. 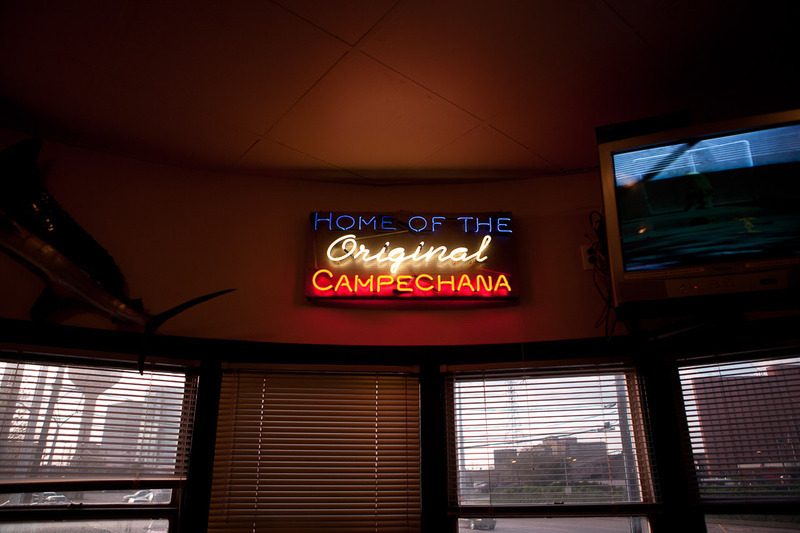 Campechana is essentially shrimp and crab ceviche mixed with pico de gallo mixed with avocado. 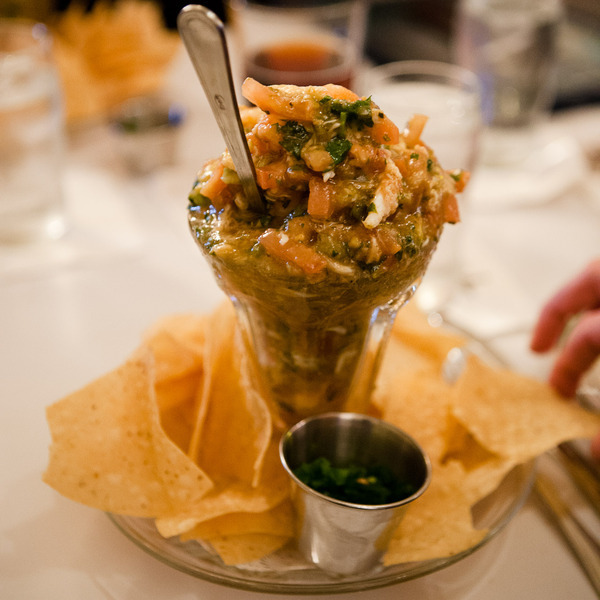 It's piled high into a sundae glass and served with tortilla chips. It's better than and unlike anything you've had anywhere; fresh, succulent and addictive. The rest of our meal was equally fantastic; huge amounts of grilled seafood and a slice of warm pecan pie a la mode to complete the meal and put us all over the edge of fullness. After a lovely evening of good wine, good food and good conversation with the Meyersons, we were reluctant to leave, but had plans to have a nightcap at a bar that Jimmy also works at. We headed north to the Petrol Station, an old gas station turned craft beer bar that has about 30 local brews on draft. Full of seafood, we slowly sipped on a local IPA Jimmy recommended. We were fading fast, but after a few more after-work drinks with Jimmy, we left with the bittersweet-ness of spending not nearly enough time with old friends mixed with the warm feeling of a full belly and Houston hospitality. 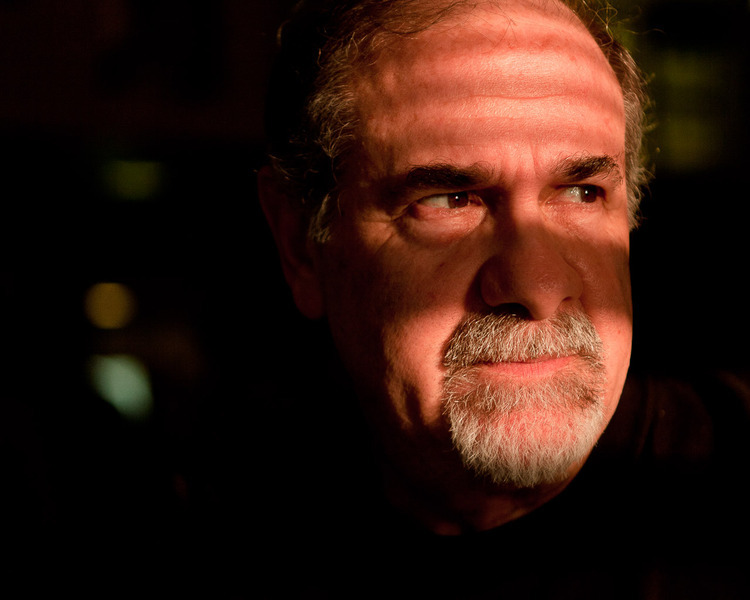 Special thanks to Paul p. (who suggested Stop in to say hi to Arthur Meyerson) and Arthur M. (who suggested Come see me) for making this blog post possible!